Al Mujib Dam, Jordan. Photo: Bernard Gagnon. As outlined in ‘Water Resources’, Jordan’s main water resources come from surface water and groundwater sources. Traditionally, over thousands of years, these water sources were accessed locally by farmers using basic irrigation techniques, nomadic herders watering their herds, and townspeople either extracting directly from the river, or from wadis (during the rainy seasons), natural springs (including oases) and hand-dug wells. As technology developed, harvesting and storage of water, including rainwater, was introduced. Rainwater was captured and stored in constructed underground cisterns. Dams and artificial pools were built to capture and retain water from the wadis to be available for use throughout the year. Even the water used in mosques for washing before prayer was captured and recycled for use in gardens. Interestingly, these traditional methods have only recently been re-examined and reintroduced in a more systematic way to increase the availability of water for local domestic use and irrigation. Over the last 50 years, Jordan has grown as a modern country with expanding urban centres, and domestic, agricultural and industrial demand for water has increased. In order to meet these needs, standard technologies used worldwide have been put in place. Large dams have been built to capture and control surface water. Large pumping and piping systems have been established to move water from the dams and groundwater sources (see ‘Water Resources’) to where it is needed in the big cities, for industrial use, and for agricultural irrigation. As water demand in Jordan continues to increase, stress on the country’s natural water resources continues to grow as well, widening the gap between supply and demand. As Jordan can no longer depend only on its natural water resources, it is necessary to look for alternative sources of water. One of the sources already being harnessed is domestic wastewater, which is treated and reused as an alternative water supply, especially for agricultural irrigation. As discussed in ‘Water Use’, in 2013 the agricultural sector used around 53% of the country’s water supply. Currently, between a fifth and a quarter of this amount is being provided by treated wastewater. While this is a good start, more is needed, so that the growing demand for fresh water in the domestic sector can be met. Jordan plans to invest heavily in developing and maintaining the current water infrastructure, as the current level of wastage of water resources is costly. For example, estimates of current losses through water supply network leakage are as high as 50%. The maintenance of storage dams, rehabilitation of wastewater treatment and reuse systems and water distribution systems and increase of urban water supply are the main priorities at the moment. In addition, for Jordan to meet its growing needs it must expand its water supplies by exploiting new resources (see ‘Current and Planned Infrastructural Projects’). Making better use of the limited water supply by using existing supplies more efficiently is crucial. This includes a focus on preserving water, reducing system leakages and increasing wastewater usage. 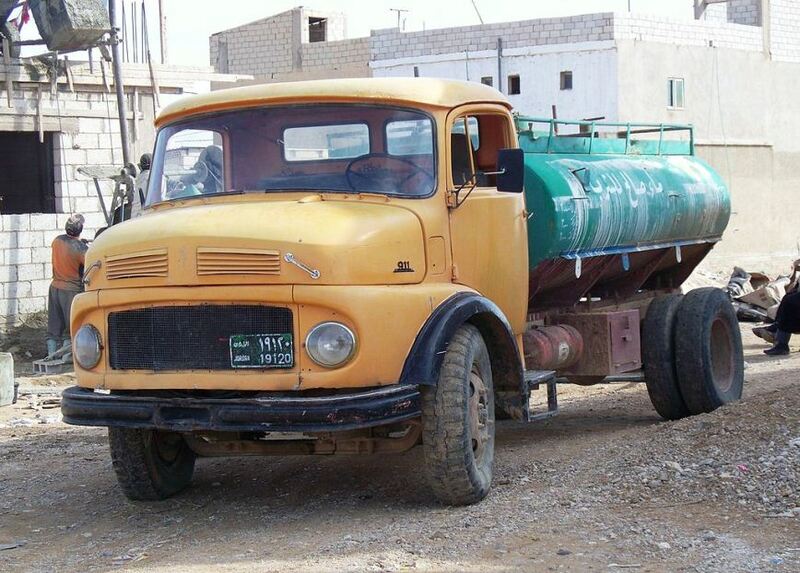 Water tanker delivering water to residential area, Jordan. Photo: High contrast. Wadis are streambeds or gullies that are dry except in the rainy season. EDM Global, 2015. Every drop matters. See www.everydropmatters.com/global-edm/jordan/ for project overview. Ghneim, A., 2011. Wastewater Reuse and Management in the Middle East and North Africa: A Case Study of Jordan. MSc Dissertation. Published by Universitätsverlag der TU Berlin. al-Ansari, N. et al., 2014. ‘Water Supply Network Losses in Jordan’. Journal of Water Resource and Protection, 6, 83-96.